Two supposedly college-aged Americans are off exploring the moors of Northern England when things start to get all dark and atmospheric, as they are apt to do in the moors for some reason. They seek refuge at a nearby pub filled with locals who can barely contain their seething hostility to the brash outsiders. And also pre-The Young Ones Rik Mayall (RIP). After some genuinely foreboding conversation, David and Jack are sent off on their way and promptly attacked by a bloodthirsty werewolf. This apparently happens fairly frequently, but that serves as little comfort to them. David wakes up in a hospital three weeks later and Jack doesn't wake up at all because that dude is super dead, although his rapidly decomposing corpse does make a few more appearances as he helpfully tries to convince his best friend to commit suicide before turning into a werewolf himself. You know, as you do. It's important to note that the werewolves in this film are not cuddly little buddies. 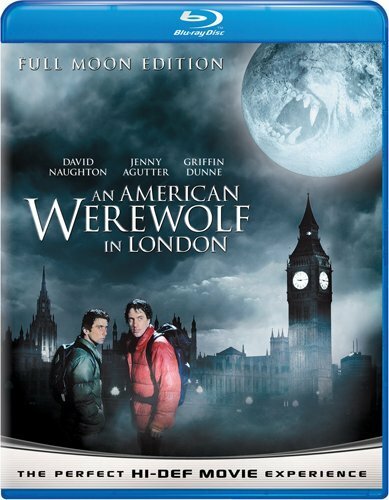 Despite the fact that An American Werewolf in London has an offbeat, camp sense of humor to it, the werewolves are most decidedly not played for laughs. You know how in movies like Twilight, the werewolves transform by ripping off their shirts revealing gleaming eight-pack abs, then leaping into the air as they turn into wolves in one elegant motion? Yeah, picture the exact opposite of that. In this movie, the werewolf transformation is violent and gruesome and painful. Really, it's why this film is remembered so fondly. Take a look. A+ use of Bad Moon Rising and Blue Moon, which serve as a comically cheerful counterpoint to the horror of David's transformation. It's probably the gold standard for all horror movies. Your homework tonight is to go find me a better werewolf transformation sequence on film, which is an exercise in futility because it straight up doesn't exist. Anyone who even mentions Taylor Lautner gets a punch in the throat. Funny story: An American Werewolf in London really benefited from the massive uproar (read: quiet rumblings of disapproval) at the Oscars the previous year. In 1980, David Lynch made The Elephant Man, a film that featured the groundbreaking makeup effects required to turn John Hurt into a hideously deformed Victorian man. But since the Academy didn't have a Best Makeup category at the time, it went unrecognized. By way of apology, the Academy created a new award for makeup the following year, and thus a little horror film released at exactly the right time was able to walk away with Oscar gold. Richly deserved, too. An American Werewolf in London is a fun movie in its own right, but the reason we're still talking about it in 2016 is because of the practical makeup effects it uses. Both the werewolf transformation sequence and the grisly appearances of Jack throughout the film are beyond reproach and impressive even over thirty years later. There's also a lot to be said for the movie's bizarre sense of humor. Like when David is trying to say enough nasty things to the policeman to get himself arrested. After insulting the Queen, Prince Philip, and Winston Churchill, the worst thing he can think of to say is, "Shakespeare's French!". He really knows how to hit the English where it hurts. And I loved the sequence of the morning after, when David wakes up in the wolf pen at the zoo. I wouldn't ordinarily approve of a scene where a naked man hides in a bush and lures a little boy over with the promise of two pounds, but the punchline is worth it. Overall, An American Werewolf in London is an uncommonly well-rounded horror film. It has its share of scary moments, particularly whenever dead Jack shows up. There's something supremely unsettling about the scene in the adult cinema where all of David's victims are cheerfully discussing all the different ways that he could kill himself. But the film also has a surprising amount of emotional depth, like when David calls his little sister and basically says his goodbyes. David Naughton does a great job of playing a lot of different levels in a role that could easily be one-dimensional. Which is impressive, because until this movie came out, he was mostly just known for being a super passionate fan of Dr. Pepper. There are a lot of worse ways to spend two hours than watching An American Werewolf in London, and despite its reliance on practical special effects, the film really holds up for modern audiences. Two enthusiastic thumbs up. Take my advice though, and don't get too excited and try to sit through An American Werewolf in Paris thinking that it's probably just as good as the original. That would be a mistake. It's really, really not.